← The Suite of Persian Pleasantries. ok, the first time i clicked it said it was no longer available…. now it’s good. thanks. i will go now. This is absolutely amazing. I was entirely prepared for the exact opposite to occur. And whoever edited the music for this clip is a genius. I hate to be a skeptic but I don’t believe it. 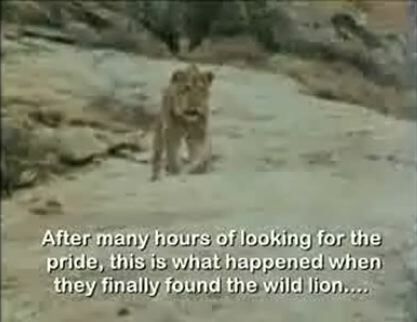 Maybe they found the lion and he remembered them but why would his wife be so tame. As soon as she saw her husband wrestling with those white guys she would have went into attack mode. She’s never been touched by a human and now she’s going to let them pet her? Nah man. Just my opinion. I wish I could send you a picture of my play brother who is black American who is playing with some lions in Australia. I told him he was pretty brave for that. I’ll send you the link via facebook. Crazy. Thank you for sharing. Amen! When will they learn that blacks are singularly qualified to be animal-handlers. It’s just simple genetics… but try telling THAT to a white zoologist, and they call you racist!